Aaaah, finally I got my hands on the first green asparagus for us this year. 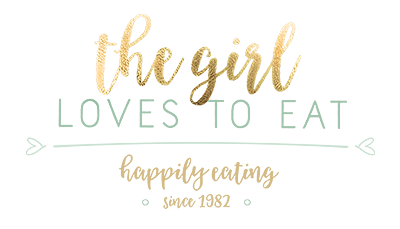 I love them in soup, with pasta, even in casseroles, but I love them most just roasted with some garlic. They taste the best if you roast them on a nice hot grill, but a griddle like I used for this dish does the trick, too. And of course they go great with any meat. 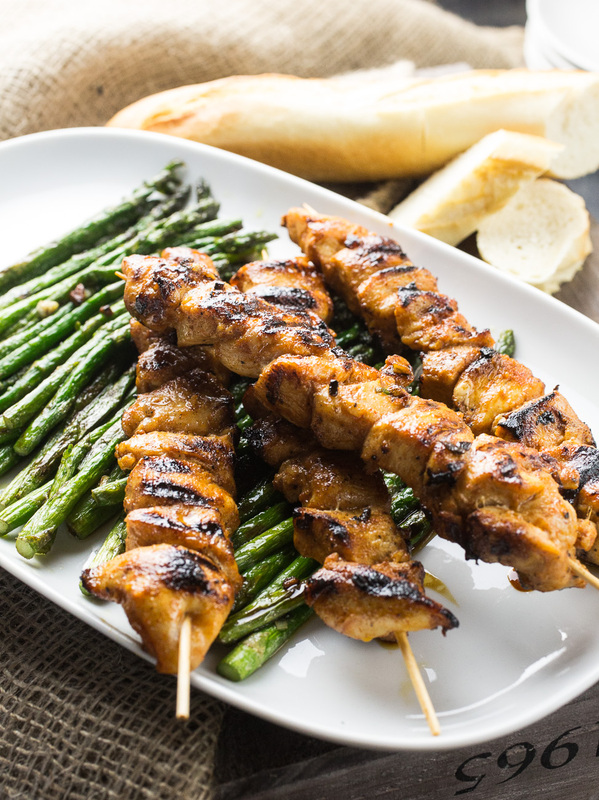 For this dish I chose some spicy chicken skewers, that complement the sweetness of the asparagus. Speaking of grilling. Alex and I are desperately waiting for our new grill to arrive. In our new flat we have a super nice, huge balcony and since we are crazy about grilling in summer we needed a new balcony-friendly grill. An open fire is not an option, because our landlord won’t be too thrilled if we burn down the woodwork on the roof. So we got ourselves a gas grill and we’re beyond excited to try it out. 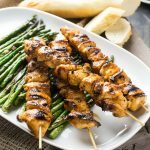 This lovely little recipe here, was completely done in the kitchen in two griddle pans, but you could also roast the asparagus with your broiler in the oven or you could just grill everything outside. Whatever you fancy. It will always be delicious. Cut the chicken breasts into bite sized chunks. Combine all the ingredients for the dry rub und marinate the chicken bites with it. Cover and refrigirate for at least 30 minutes for up to 24 hours. Divide the chicken chunks between your skewers (I used 6 wooden skewers). Heat two griddle pans over medium high heat and brush both with olive oil. Add the asparagus to one griddle pan and the skewers to the other. After 5 minutes add the chopped garlic and salt and pepper to taste to the asparagus. 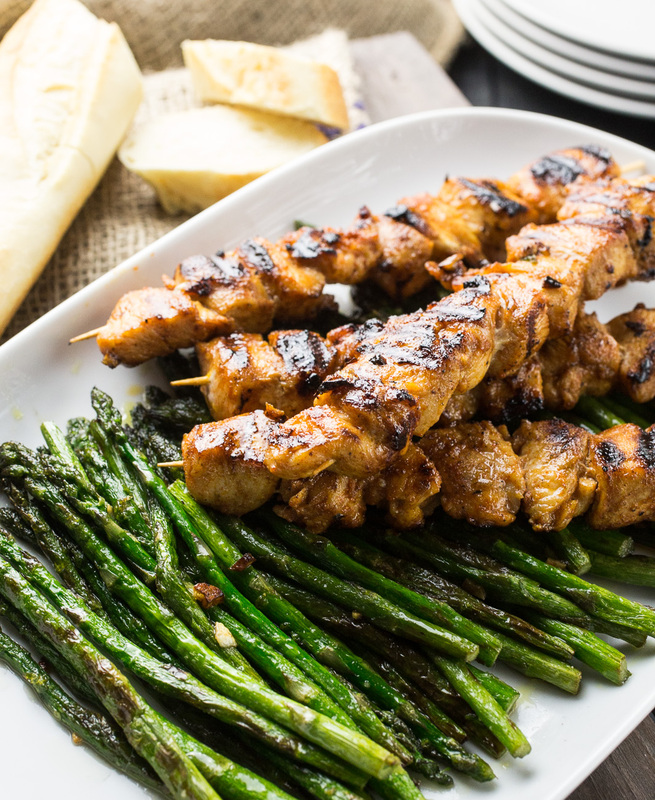 Rotate the asparagus and the skewers frequently until the aspargus have softened and are slightly charred and the chicken is golden brown and cooked through. In the ingredients I stated, that I used green asparagus for this dish. This might be confusing for my US readers, because I believe that white asparagus is not something that's common in the United States, whereas in Germany green asparagus is only slowly on the rise. I don't really like white asparagus, to be honest, it tastes too sweet and bitter for me, so you will probably just find the green variety here on my blog. 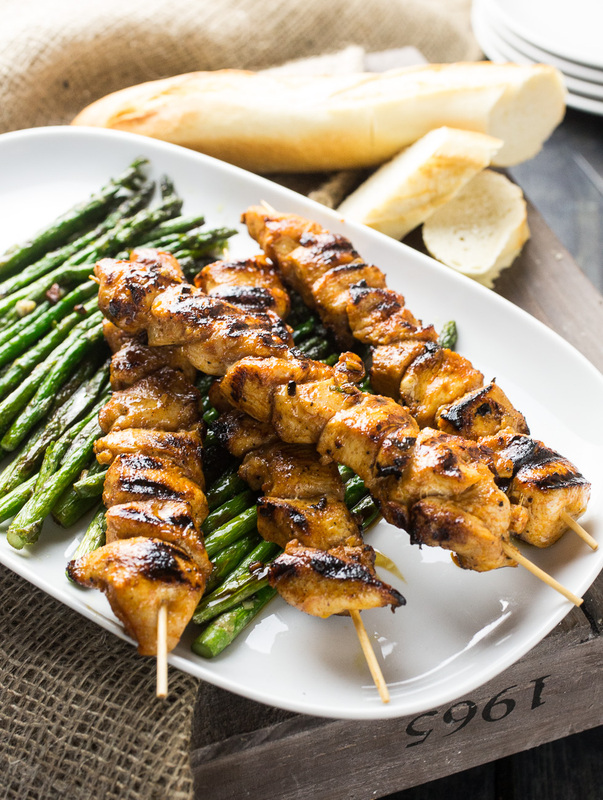 What gorgeous looking chicken skewers! And my favorite way of having asparagus is simple like yours. 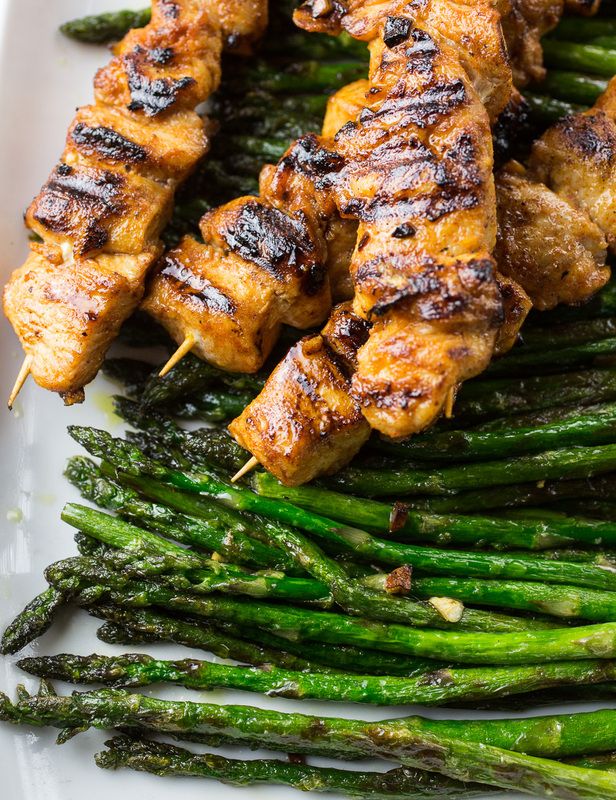 A little caramelization, a little oil, and all that tasty asparagus flavor.